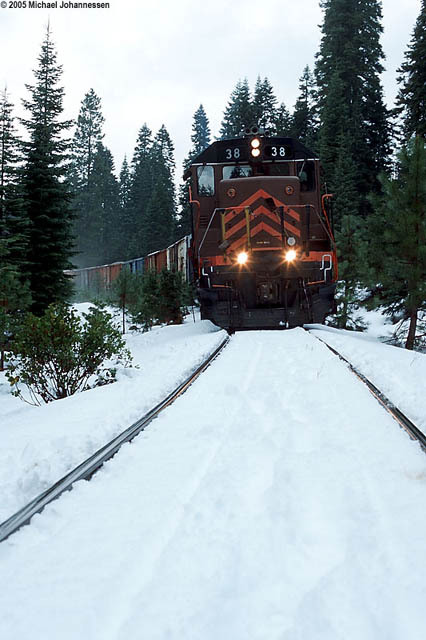 On 11 November 2005 the McCloud Railway ran another significant "last run", this time to Hambone. 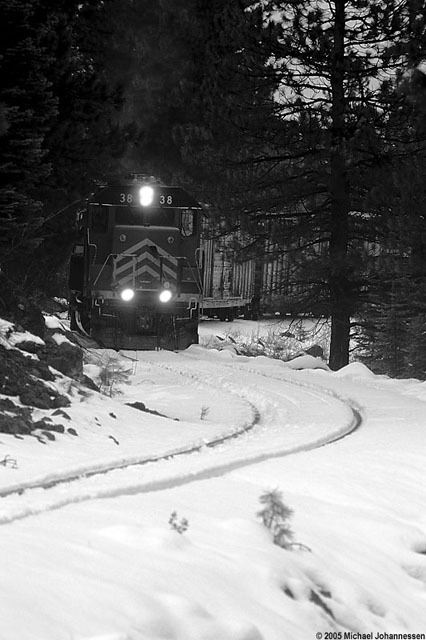 The last through freight to and from Lookout Junction ran through Hambone on 16 December 2003. The rails through this remote spot remained quiet until 28 November 2004, when a work extra ran out to the ballast pit at Porcupine to get a few last carloads of cinders. A speeder run made it to Hambone in the summer of 2005, and during October a salvage contractor hired by BNSF removed the line beyond the end of McCloud Railway ownership at Hambone, leaving the spot at the end of a long spur up from Bartle. Hambone first came into existence as a McCloud River Lumber Company log camp around 1920. The camp, originally known as Camp 2 and then as Pondosa, consisted of a sizeable community to house loggers and woods-based railroad crews. The lumber company also built a large repair shop. All of this activity ceased after 1927 when the lumber company moved the camp, and the name, south to the current site of Pondosa. This area then became known as Hambone, reportedly after a ham bone nailed to a tree. Activity returned to Hambone in 1928 as the lumber company extended a new line through the site, headed for the newly acquired White Horse tract far to the east. The McCloud River Railroad finally reached Hambone around 1929 when it acquired the trackage from Car A to this spot from the lumber company. At the same time the lumber company sold the line east of Hambone to the Great Northern Railroad. The two railroads chose Hambone as the junction spot, as it was about the only place in the area with enough flat ground to build the necessary interchange yards and servicing facilities. 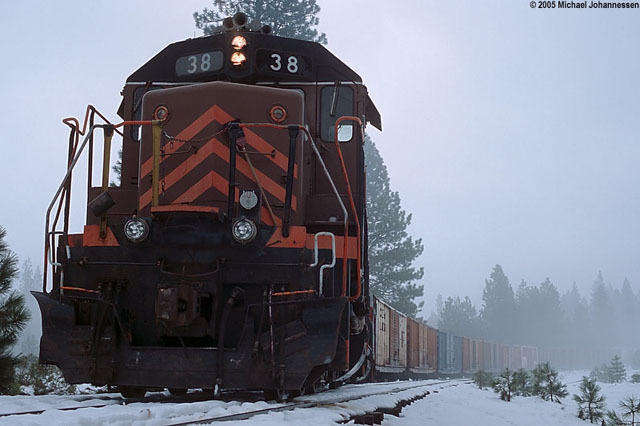 However, the Great Northern decided to hire the McCloud River Railroad to operate their portion of the line, and as a result the planned facilities were never constructed. The railroads did base a section gang at Hambone. Elkins Cedar Mill built a sawmill and a small community to support it at this site. The sawmill and the community functioned from roughly 1936 until 1943, when it was closed and the camp was raised. The railroads bypassed the original site of Hambone in 1956 with a major line relocation. The railroad built a 1,032 foot long passing siding and a section shed on the new alignment. 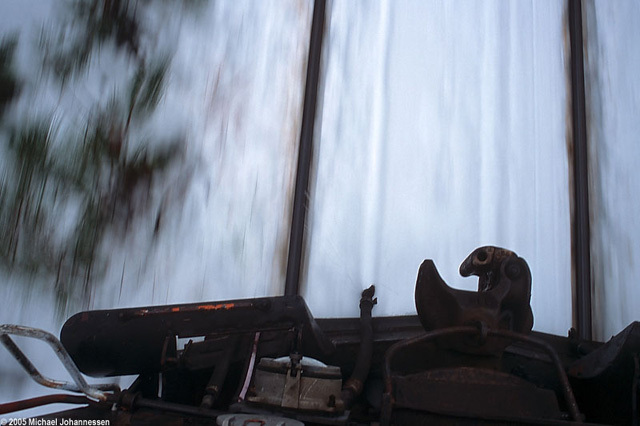 Hambone continued to feel the rumbling passage of the nightly freights bound for Lookout Junction until 1978, when a series of sawmill closures brought traffic levels down. The next 25 years saw operations through Hambone vary from one train every two or three weeks up to 3-4 trains a week, depending on the ebb and flow of traffic patterns. Traffic handled to and from Lookout Junction declined to less than six cars a week after 1998. A haulage agreement ended all rail movements in December 2003. BNSF received permission to abandon the line east of Hambone in early 2004. The McCloud Railway Company received permission to abandon the line from Bartle to Hambone in October 2005. However, some work still had to be done, as the siding at Hambone still held a string of GE Capital-owned boxcars. 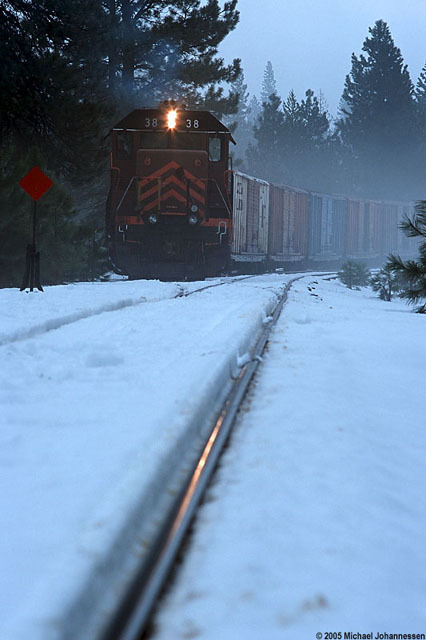 The McCloud Railway finally decided to get the stored boxcars in November 2005. The railroad needed track materials, and such parts could be removed from the line out to Hambone. However, the boxcars had to be removed first, and on Friday 11 November 2005 a crew made one final trip to Hambone with locomotives #37 and #38 to retrieve those cars. The train moved the cars from Hambone down to a natural sag a little above Car A, where they were left. 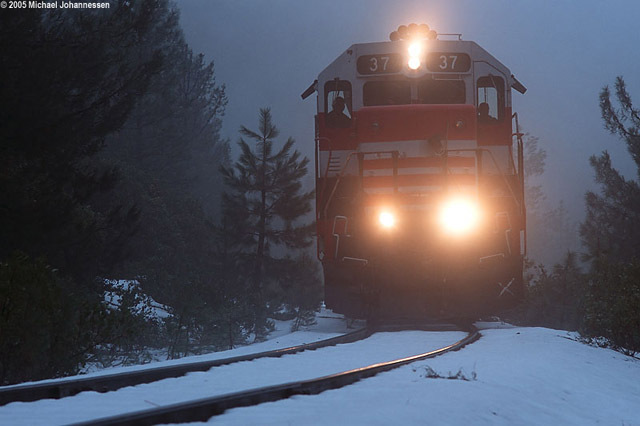 The McCloud Railway Company received permission to abandon the line between Bartle and Car A in October 2005, but that decision is current stayed pending resolution of some potential Offers for Financial Assistance. 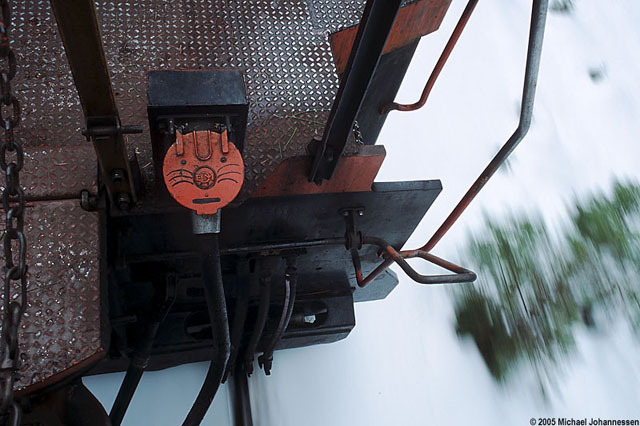 There is at least a chance that the mainline to Burney may be saved, but the last remnant of the Lookout Line will serve no real purpose to any future operator. At least one more trip will need to be made up from Bartle to get these cars before the last part of this line can be salvaged. A few railfans knew of the move in advance and were able to tag along. 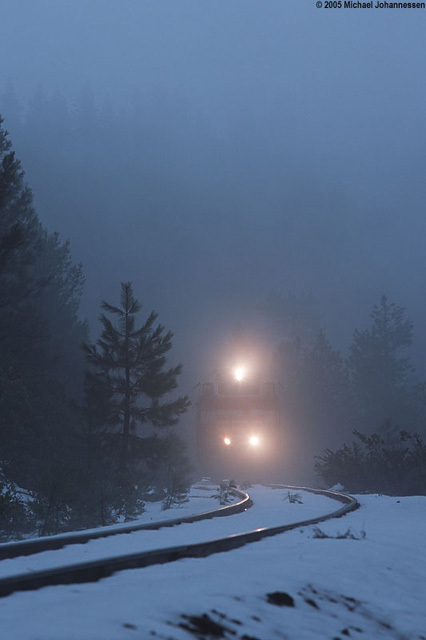 Michael Johannessen was among them, and he captured a number of images of this last train to Hambone. His photographs are presented on this page with his permission. Hambone saw railroading activity for the better part of eight decades. Silence has returned to the forests. 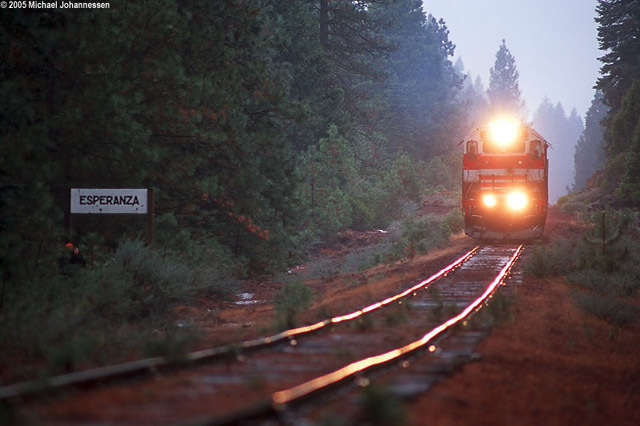 The light engines rolling through Esperanza. Rolling through the fog near McIntosh Vista. Another shot near McIntosh Vista. #38, taken from the #37. 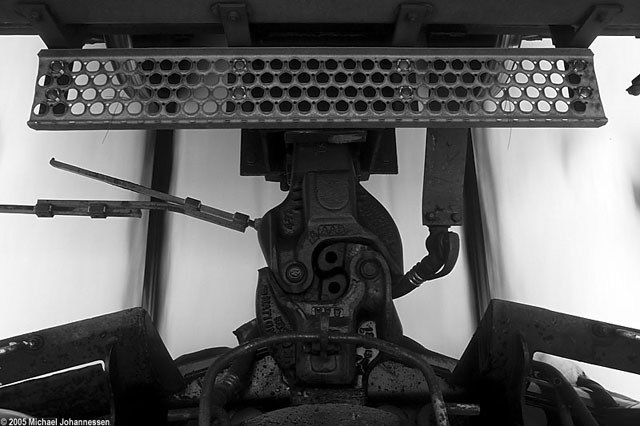 The plow and front coupler on one of the locomotives. The last train at Hambone, coupling onto the boxcars. A close up shot of the #38 in Hambone. 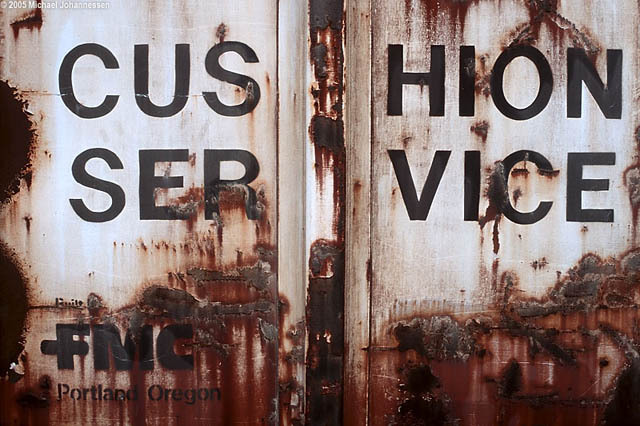 A detail shot of some of the lettering on one of the ex-McCloud River boxcars. 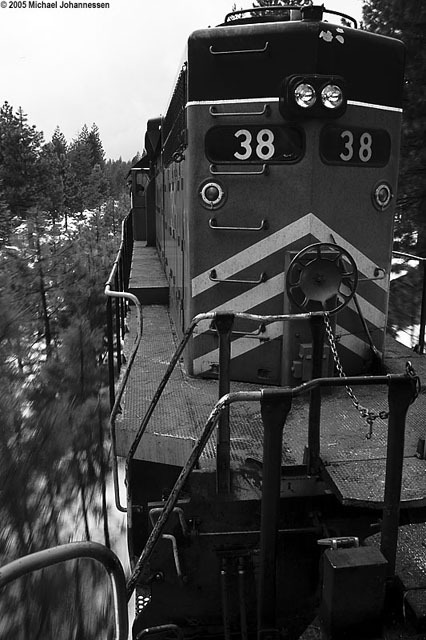 The #38 leads the train back towards Car A. A close up shot of the coupling between the #37 and the first boxcar. The train approaching Car A. A drawing of a cat face on one of #38's multiple unit connection caps.